CarGurus has 97 nationwide Mulsanne listings starting at $88,888. Those with the wherewithal to drop over a quarter-million dollars on a full-size luxury sedan might want to take a look at the 2017 Mulsanne, the flagship model of the iconic British firm of Bentley Motors Limited. Although it seats 5, the Mulsanne is tailored for those who prefer that their chauffeur do the driving while they lounge in a palatial rear seat. The twin-turbo V8 powerplant, however, will doubtless entice more than a few owners to take the wheel of this ultra-luxurious grand tourer on the chauffeur’s day off. A new Extended Wheelbase trim has been added to the Mulsanne lineup for 2017, joining the Sedan, which debuted in 2011, and the performance-enhanced Speed introduced in 2015. This stretched version offers a 138.4-inch wheelbase that’s a full 9.8 inches longer than the standard-length Mulsanne and expands rear-seat legroom by as much. The 2017 Mulsanne sports exterior upgrades that include a wider grille, revised head- and taillights, a larger hood, and redesigned bumpers. A reworked chassis offers improved air springs, new bushings, and variable engine mounts for a ride that’s 4 decibels quieter and all but vibration-free. New 20-inch Dunlop tires have foam-filled cavities that further tame an already suave ride and quiet cabin noise by 50 percent. The upgraded suspension offers 4 selectable ride settings—the default “Bentley,” Comfort, Sport, and a new Custom mode—and continuous damping control, which lowers the Mulsanne’s chassis at cruising speed for reduced drag. The aristocratic cabin is outfitted with enhanced infotainment features, additional premium leather, more genuine wood accents, newly available quilted or fluted upholstery, and glass-enclosed switches for the power windows and door locks. A limited-production (50 units) First Edition sub-trim is also scheduled for 2017, which, in the Extended-Wheelbase version, boasts door and dashboard inserts fashioned from Great Britain’s third-oldest tree, a 350-year-old walnut downed in a 2007 windstorm. The Mulsanne packs a twin-turbocharged 6.75-liter V8 engine that sends 505 hp and 752 lb-ft of torque to the rear wheels in the Sedan and Extended-Wheelbase trims and 530 hp and 811 lb-ft in the Speed trim. A revised 8-speed shiftable ZF automatic transmission handles the V8’s power, and it now offers an S mode that keeps the engine above 2,000 rpm to make sure the turbochargers will be ready for instant action. The tweaked transmission combines with automatic cylinder deactivation at cruising speeds, helping the Mulsanne achieve an EPA-estimated 11 mpg city, 18 highway, and 13 combined. The Sedan trim can reach 60 mph in 5.1 seconds, and the Extended Wheelbase in 5.3 seconds, and both top out at 184 mph. The Speed boasts a 0-to-60 time of 4.8 seconds and a maximum speed of 190 mph. The 2017 Mulsanne’s hand-crafted cabin pairs a wealth of old-world décor with modern gadgetry. If you’re dissatisfied with the standard selection of 24 upholstery colors and 12 veneers, you can further personalize your Mulsanne via Bentley’s Mulliner customization workshop. Mulliner also offers such extra-cost touches as a Flying “B” hood ornament, a dashboard-mounted Breitling timepiece, and 3 different refrigerated storage bins, complete with champagne and flutes. The Mulsanne Sedan is outfitted with a reversing camera, 4-zone automatic climate control, a remote garage-door opener, front and rear parking sensors, ambient lighting, and a 14-speaker audio system. The Speed trim adds a sport-tuned suspension, unique stitching, embroidered Bentley emblems, and 21-inch painted alloy wheels, while the Extended-Wheelbase trim is available with a rear power sunroof. Other optional features include front and rear fold-out tables and a pair of 10.2-inch tablets that rise from the front seatbacks and can be used with the 4G Wi-Fi hotspot to check your stock portfolio, listen to your favorite opera, or watch a movie. A premium 2,200-watt Naim audio system, knurled accents, massaging and ventilated seats, a heated steering wheel, a side-view camera system, and adaptive cruise control are also available. For 2017, a blind-spot alert is now standard aboard the Mulsanne, complementing the usual array of safety features like antilock brakes (ABS) and traction and stability control. Front and rear side-mounted airbags, head- and thorax-protection airbags, LED headlights and daytime running lights, turn-signal-integrated mirrors, and a remote antitheft alarm are also included. Because of its prohibitive price (the Sedan has a base MSRP of $306,425) and limited sales projections, the Mulsanne has not been tested by either the National Highway Traffic Safety Administration (NHTSA) or Insurance Institute for Highway Safety (IIHS). Expect the 2017 Mulsanne to be challenged by the Rolls-Royce Phantom and entry-level Ghost and the Mercedes-Benz Maybach S550/S600. Both Rolls-Royce models are bigger and pricier than the Mulsanne, while the Maybach offers a turbocharged V12 powerplant and Euro-style posh for a comparative bargain. 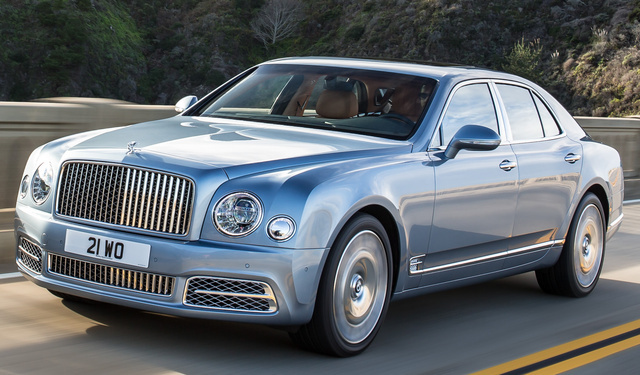 What's your take on the 2017 Bentley Mulsanne? Have you driven a 2017 Bentley Mulsanne?